The Vikings must trim their roster to 53 players by 3 p.m. on Saturday, but Daniel House took a premature stab at how the coaches may structure the personnel groupings. The Vikings wrapped up their preseason slate last night and the regular season begins next week. The team will continue preparations for the 2014 regular season this week and will open up in St. Louis a week from Sunday. There is certain to be players from other teams on the final 53-man roster, but I have listed the roster and practice squad as the team currently is constructed. The team must trim the roster down to 53 players by Saturday at 3 p.m. There is sure to be some difficult decisions the coaching staff will need to make when deciding the personnel groupings. Analysis: There are absolutely no questions at this position and now that Matt Cassel has been named the official starter, the stability has arrived at quarterback. If there are any issues, Teddy Bridgewater can enter at any point during the 2014 season. Christian Ponder probably didn't do enough to increase his trade values and it appears the coaching staff will utilize his skills as the third-string quarterback. Analysis: There really is no question with the top three Vikings running backs this season. Adrian Peterson is healthy and ready for the season, Matt Asiata has refined his body, and Jerick McKinnon is going to be the 'jack-of-all-trades.' Where the decision will get difficult is when they decide what to do with running back Joe Banyard. Banyard has had a phenomenal preseason and rushed for 111 yards on 18 carries last night. He performed well in the preseason last year, but the Vikings were able to slide him onto the practice squad. This year it seems highly unlikely he could survive waivers if he continues to perform well and is placed on the practice squad. The Vikings don't really have a choice in this situation and may decide to keep Dominique Williams for the practice squad or they will look to add a running back in free agency. Analysis: This position battle became clear last night and it appears the coaching staff will lean towards keeping Jerome Felton for the 53-man roster. Felton is the veteran in the group and didn't do anything to lose the job during the preseason. He didn't play last night, which likely indicates they know what they have in Jerome Felton. Zach Line is a very good developmental product and solid run blocker, but just can't crack a roster with a team that doesn't have a huge focus on the fullback in the offense. Note: Jerome Simpson will be suspended for the first three games and will return in week four. Analysis: Jerome Simpson has been officially suspended for the first three games, leaving a spot open for Rodney Smith to slide onto the roster. Smith missed the last preseason game with a neck injury, but it appears he has done enough in the earlier preseason games to punch his ticket onto the roster. 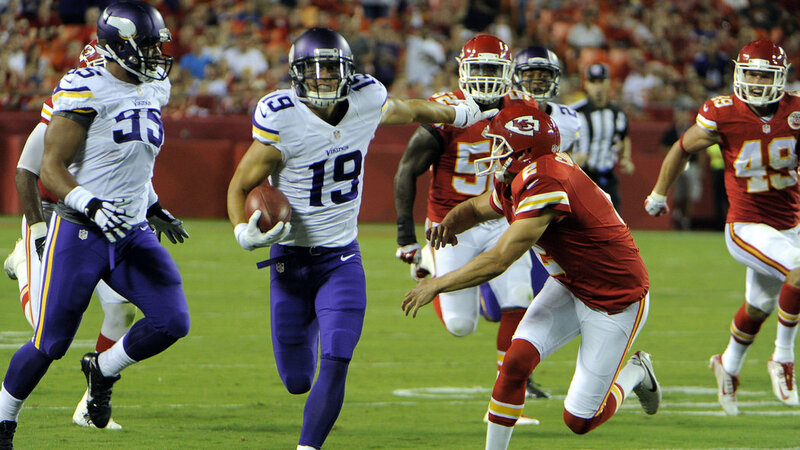 Adam Thielen hauled in a touchdown in the final exhibition and continued his emergence, before injuring his hip in the third quarter. Both of these players are sure bets to make the roster, especially during the absence of Jerome Simpson. Analysis: The coaching staff simply cannot find a reason to release tight end Allen Reisner. Chase Ford already is in the dog pound for discussing his injury before he should have and he missed the entire training camp and preseason in the process. Reisner proved he has some skills as a pass catcher and run blocker, which has never been an issue with the former Iowa Hawkeye. Analysis: The Vikings will have a difficult decision to make among the offensive line, but they decide to keep veteran guard Vlad Ducasse and undrafted swing tackle Antonio Richardson. Austin Wentworth performed well in training camp and the coaching staff likes the strides he made throughout training camp and the preseason. However, they have a stronger likelihood of placing Wentworth on waivers, without him being claimed. Antonio Richardson is a well-known name among many league circles and would likely be snatched, in the event the Vikings decided to release him. Analysis: The defensive line is the deepest position group on the Vikings roster and the cuts will be very difficult at this position. The Vikings are using Tom Johnson in plenty of sub packages and can't afford not to have him on the roster for his pass rushing abilities. Shamar Stephen witnessed action in the middle of the defense during Linval Joseph's absence and is putting out some great film for other teams to see. With that being said, the Vikings can't risk losing an athletic interior defender like Stephen and will find a place for him on the 53-man roster. Fred Evans posted a great third preseason game and eliminated any chance he won't make this team. Analysis: This position is very tough to project, especially considering all the shuffling that has taken place among the linebackers. Brandon Watts is young and raw, but the coaching staff feels they can slide him onto the practice squad. The coaches like the talent and depth at this position and will look to keep as much young talent as possible. Mike Mauti hasn't seen many reps at linebacker lately, but his role on special teams will be one of the reasons why he just barely slides onto the roster. Also, many of the coaches look at Mauti as a developmental product that just needs more coaching. Brandon Watts didn't play enough in the preseason to supplant a player that has been in the league before. Analysis: The defensive backs are very hard to trim this season, which is a great problem to have. The coaching staff decides to keep five cornerbacks and the team surprisingly decides to part ways with cornerback Josh Robinson. The ceiling is high for Robinson, but he can't stay healthy and he didn't have the greatest training camp when he was on the field. The team will work with younger players like Jabari Price and Marcus Sherels, who are showing some results on the field. Kurt Coleman has had a solid camp and it is still undecided who will start alongside Harrison Smith. Blanton has been injured, but proved he can handle the rigors of the defense early in camp. He has the intelligence to play the position and Zimmer can't resist having him on the roster. Chris Crocker was signed in training camp and hasn't seen an extensive amount of snaps. Mike Zimmer wants to keep him as a veteran presence in the backend of the secondary, but Crocker hasn't really done anything to separate himself in the preseason. They find a way to keep Crocker by releasing cornerback Josh Robinson. I see the team keeping a player like Andrew Sendejo who can play special teams, along with safety too. Antone Exum is a player for the future and he just needs to time to develop and become more fundamentally sound with his technique.